Ah, there’s nothing quite like casting on for a new project. Sorry to those of you who were misled into thinking that I was casting on for the Gerda stole. Sadly I don’t have the time, patience, or talent to knit something this fine. I’m a dk girl, all the way. In the end I decided to knit the Central Park Hoodie from Knitscene (which is getting better every issue, by the way). I hear that it’s a great pattern to knit, and it’s just my style. As is the yarn I’ve chosen to knit it in: pillar box red organic merino, or as I like to call it, heaven in a skein. 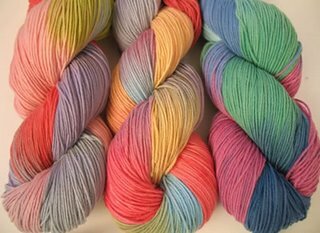 I have it in 4ply and dk weight, and it’s now available on the site here. I can highly recommend it for knitability. It’s squishy and soft, with good stitch definition. And it dyes beautifully. We’ve done lots for next week’s OOW, and I foresee it becoming a favourite. As will this red hoodie, I suspect. So! Much! Work! So! Little! Time! It opens on Friday, December 1st at 4pm (GMT). There will only be 50 spots. First come, first served. No begging, I beg ya. Current club members can rejoin, and add the six month membership to however long their current membership has left to run. We won’t be offering renewals when membership lapses, so you might want to consider this. Speaking of Sock Club, we’ve been busy this week getting December’s yarn ready to send out tomorrow. I love this colourway, it’s called Very Berry. 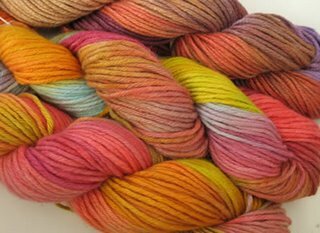 We did a few extra skeins, for the next OOW. And speaking of that (I hope you are admiring my seamless transitions today), the next OOW will be next Wednesday, December 6th, at 5pm. Yes, I know, I know, that’s the whole reason why you are here today. Not out of love for me, but out of sheer avarice. Bad luck. Sock Club and a mountain of orders have kept us too busy the last few days to get everything together for OOW. Of course, the good news is that next week’s is going to be a humdinger. 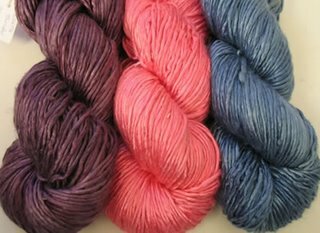 We have an enormous stash of yarn for it, especially sock yarn. So, hang on to that credit card, the wait will definitely be worthwhile. Well, what do you know, Sock Club is back. And it opens on Friday, for a limited time only. If I have on my needles at the moment, a half finished shawl, and a glove that has been abandoned after the first finger (fingers are boring, did you know? ), and if I have promised to knit Mr P a pair of gloves (and no, he won’t accept mittens as a substitute), is it completely immoral of me to be planning to start a completely different project, which will almost guarantee that I don’t finish any of these this year? 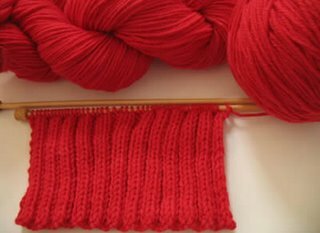 And is the temptation of pillar box red squishy organic merino yarn, dyed especially to knit Rogue, a mitigating factor? PS. Let me spread the temptation. Wouldn’t you like to abandon your current knitting projects, and knit this wonderful lace stole, designed by Kendra? If I’m going down, I’m taking everyone with me…. How Many Synonyms for ‘Big’ Are There? Every week it’s the same. We dye piles of sock yarn for OOW and every week it vanishes faster than the speed of light. Every week we think that this week we’ve done enough, that maybe we’ll even have a little left over. And then it all gets gobbled up in five minutes, and we sigh, and shake our heads, and say ‘Next week….’. So, this week we have dyed an enormous amount of sock yarn for OOW. Enormous. Huge. Gigantic. Immense. The pile of skeins is so large that I could dive head first into it and never be seen again. Well, almost. So this week, have we done enough? I guess we’ll find out at 4pm…….. In the meantime, here are some sneak peeks into what’s to come…….